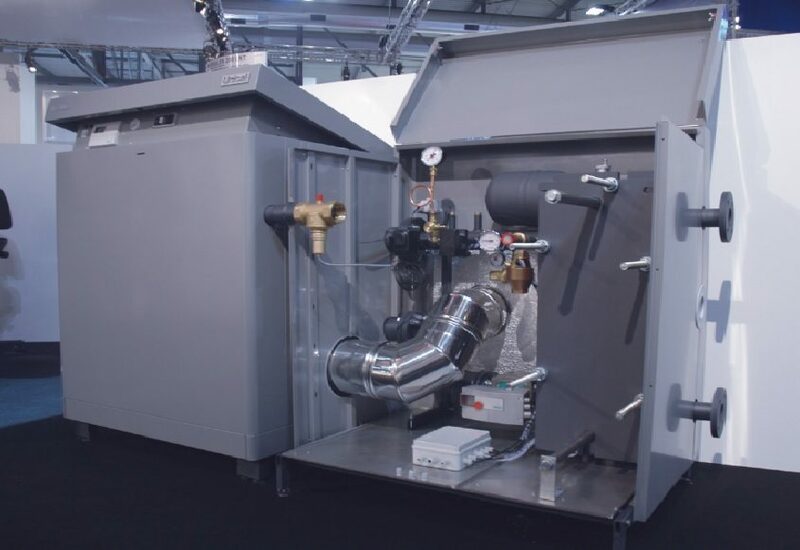 Gas Condensing Boiler -Each heat generating module within our Modulex boilers is self-contained, with its own down-firing pre-mix gas burner, fan, ignition and safety controls. As the system load decreases, a built-in Boiler Cascade Manager modulates the boiler down to the combined minimum. As loads continue to reduce, individual modules are switched off as necessary down to a minimum output of a single module – 12 kW for 100- 350 kW models and 22kW for 440-900 kW models.This ensures optimum load matching and minimizes wasteful boiler cycling, whilst maximizing energy efficiency in the process.The combination of a high modulation ratio up to 1:40 and a high output plus very low water content ensures rapid warm-up and turn-down times for Modulex boilers. 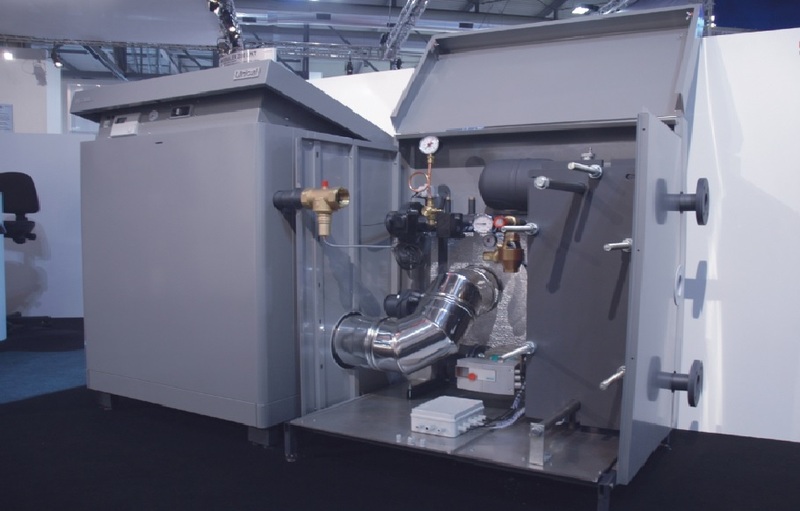 They are subsequently also able to respond quickly to changing demands throughout the heating period.Thanks to their modular design, these gas condensing boilers will continue to operate even in the unlikely event that a single module malfunctions. • Total pre-mix modulating burners, with flame surface in metallic radiating mesh. 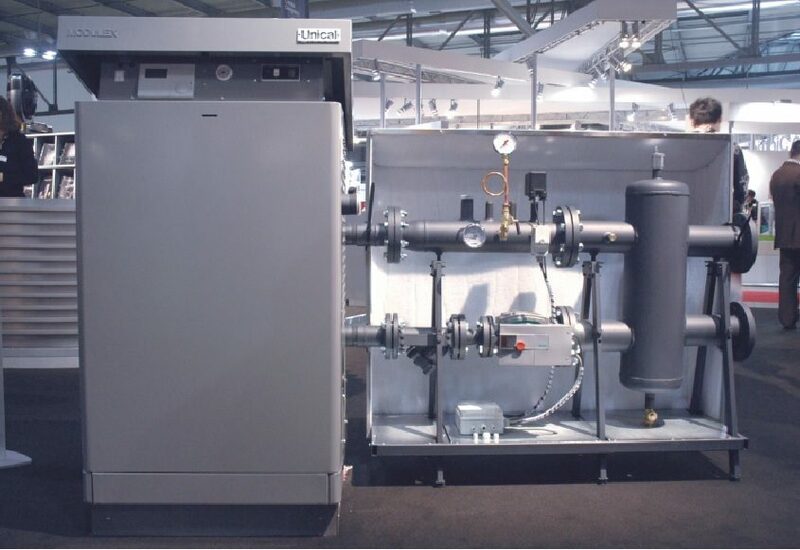 • Possibility of cascade installation of 2 or more boilers (up to 8), by using an additional E8 controller as MASTER. In a gas fired condensing boiler, hot water is generated through the heat of combustion, just like with non-condensing boilers. The resulting flue gases are commonly passed into the chimney. As a result of this, the energy which is contained in the flue gas is lost. However, condensing technology exploits and uses these gases. These gases consist, to a large extent, of hot water vapour. The flue gas heat is extracted and then feeds the energy recovered into the heating circuit. In order to gain energy, water vapour must condense. It does this at a temperature of below 56°C for natural gas fired condensing boilers. 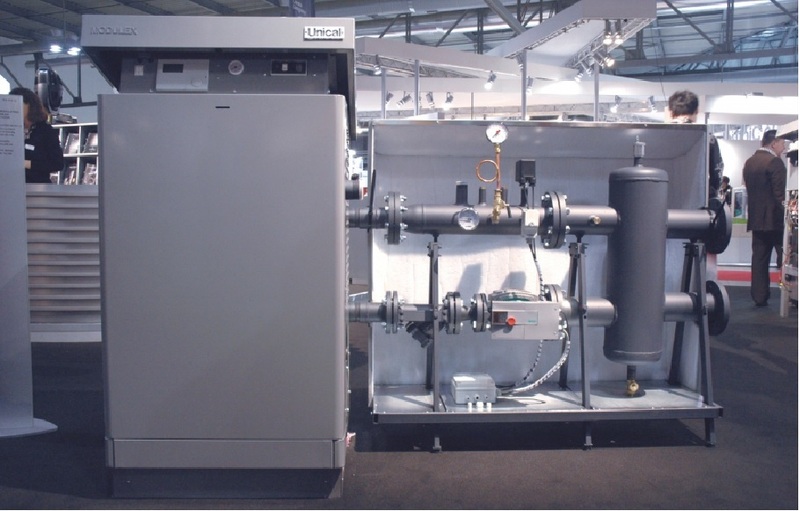 The condensing boiler cools the steam through a specially designed heat exchanger. The energy gained is then used to preheat the cold heating water. 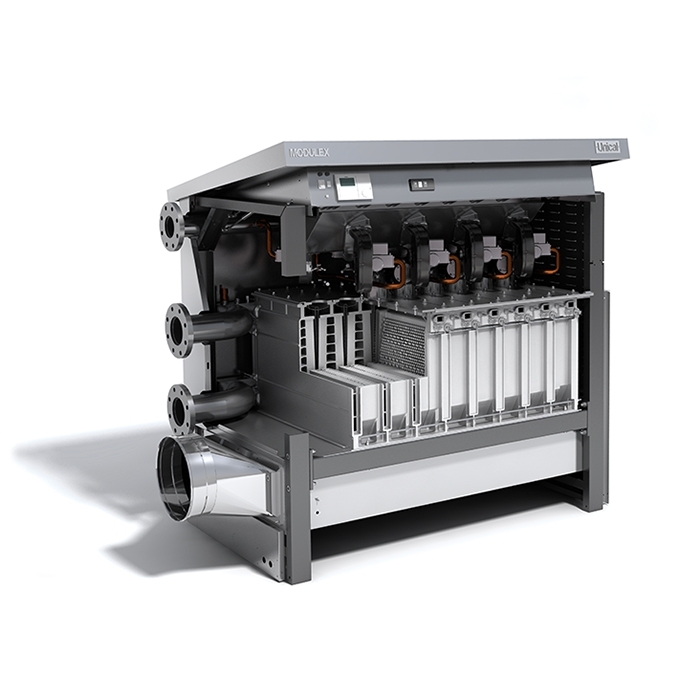 The hot water then passes through into the primary heat exchanger where it is then heated further to achieve the desired temperature. During this process, a small amount of waste water occurs which must be disposed of. The acidity of the waste water is so low that it can be conducted into a normal drainage system without further neutralisation. 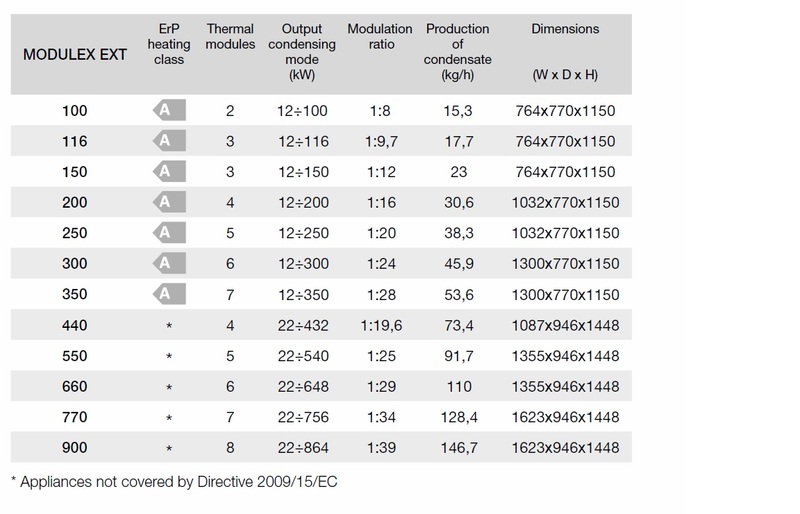 When we talk about the high efficiency of 98% of condensing boilers, the value actually refers to the “upper heating value”. This must not be confused with the “lower heating value” with which the industry usually makes its calculations. The lower heating value is the amount of heat that can be utilized in the combustion of an energy source, without causing condensation. The lower heating value therefore only contains a portion of the total fuel energy. With the installation of condensing gas boiler, another benefit is that the flue system can often be a plastic pipe system, which means that they are smaller in diameter than conventional gas boilers, cheaper , easier to install , lighter in weight and easier to fit. All of condensig gas boilers within this range have a maximum pressure of 100 Pa available at the chimmney outlet . Pa or Pascal is an expression of air pressure , and has been since 1971 , and everything , that you attach to the exhaust gas outlet / flue pipe outlet causes a frictional resistance, and this depletes the amout of PA available after going through the flue pipe or a flue bend in the exhaust system. A 90 Degree bend , you use 20 Pa of pressure , for a 45 Degree Bend you lose 10 Pa of pressure . This gives a total of 30 PA , meaningh that you have 70 Pa to play with , which would mean you could go 35 metres Horizontally or Vertically with the Flue pipe / Chimney sytem. Since the ErP ( Energy Related Products Directive ) Heating Classifications that came into force on the 26th September 2015 , all boilers up to 400 kW have to meet new efficiency levels. which basically means all commercial gas boilers , up to 400 kW , are now condensing. This not only benefits the end-user , it means reduced emissions and significant savings in energy. We have reports from some of our customers that they have seen gas consumption savings of up to 35% by upgrading to a gas condensing boiler.